Do it yourself is nothing new music in this day and age. Edmonton's Nathaniel Sutton takes it to a whole other level though on his forthcoming self-titled album though. On the record, out June 7th, Sutton is a veritable one-man band, with not only drums, guitar, bass, but mandolin, xylophone, flute, piano, banjo, accordion, and much more. Sutton isn't shy about his influences, and they come shining through on various songs. The elegant acoustic opener, for example, radiates a Mark Kozelek aura. Songs like "Bring It On (Godzilla)", "Groggy Morning", and "Master Disguise" are reminiscent of Lou Barlow, while the vocals on "Perfect Time" could easily be mistaken for Bob Mould. The catchy "Zombies Are Everywhere", but it's only the penultimate track here. The standout is the stunning "Nickel Or Dime", which boasts an impressive, almost aboriginal-inspired rhythm. Sutton's songwriting itself is endearing. His themes are lovably kooky, while his lyrics are idiosyncratic and delightful. 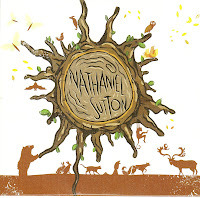 I had really no idea of what to expect when I first listened to Nathaniel Sutton. After listening to it though, I have come away a fan. My only quibble is that "Dirty Old Town" is not a cover. It's a small thing, but I feel the need to complain about something on this otherwise fantastic record. Best tracks: "Nickel Or Dime", "Zombies Are Everywhere"